Drinking chocolate milk to recover from a workout was an idea I first encountered in college. I suspect this is because I lived in a fraternity, and the fraternity house had chocolate milk on tap at all times (seriously), and the bros I lived with wanted to justify drinking all the chocolate milk they were denied as 7-year-olds. It was a piece of wisdom that got passed around so much that everyone reflexively believed it, but never bothered to actually investigate it. You can imagine my surprise, then, when I was recently listening to the sports podcast Pardon My Take, and the show ran an ad for Built With Chocolate Milk, a new campaign marketing chocolate milk as the ideal post-workout beverage. 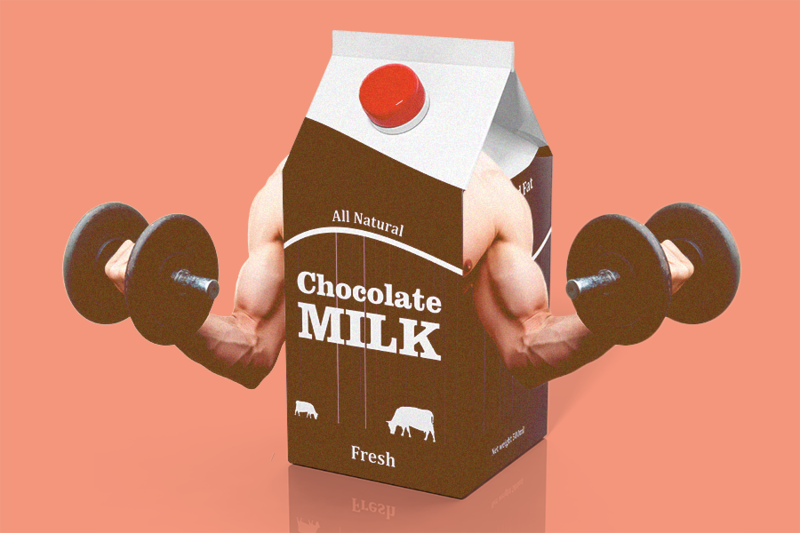 Paid for by the Milk Processor Education Program (MilkPEP, for short), the milk industry’s marketing organization, the campaign claims chocolate milk contains all the nutrients you need to feed your muscle fibers after a particularly strenuous pump sesh, brah. For one, dairy is known to cause inflammation, which is the opposite of what you need when trying to repair torn muscle fibers, Greene says. The bigger issue, though, is the excess sugar in chocolate milk. Carbohydrates (e.g. sugar) are a necessary component of the muscle-recovery process, Greene adds. But most chocolate milk is made with milk chocolate, which is “devoid of any nutritional benefit and is supplemented with an unnecessary amount of simple sugars.” In its optimal form, chocolate milk achieves the ideal carbohydrate-to-protein ratio of 4:1 for a workout recovery drink. But the kind of chocolate milk you find at grocery stores is usually closer to 6:1. “The truth is that the product doesn’t match the claims in the marketing, even if milk does have the elements one needs for recovery,” says L.A.-based nutritionist David Wiss. Wiss adds that the dairy industry has a long history of deceptive marketing practices. Their greatest con is convincing generations of Americans that milk is a vital component of a well-rounded, nutritious diet. That said, chocolate milk can be an effective recovery drink for a small subset of the population. Jeff Jalaba, a 27-year-old personal trainer in L.A., says chocolate milk is increasingly popular among bodybuilders, for instance, who have discovered it’s a healthier alternative to powder-based protein shakes. “Eating actual, whole food is always going to be better for your system than taking a supplement,” he explains. They can’t — at least if their goal is to lose weight. There are better options than dumping a half a bottle of Hershey’s syrup into a tall glass of 2 percent. Greene suggests people create their own “healthy” chocolate milk — buying grass-fed, organically cultivated whole milk at a farmer’s market, and adding to it cacao nibs with at least 70 percent cacao (and maybe even berries and spinach).